1. Some of them have jobs. They just don’t have adequate food or shelter because they’re trying to recover from financial disaster caused by long-term unemployment and medical bills. It can take months to save up for a deposit on an apartment, while still needing clothes, transportation and medical care. 2. Many of those who don’t have jobs want one. But it’s hard to get a job when you don’t have a resume, current references, reliable transportation, interview clothing, or even facilities to take care of basic hygiene. Still, they are trying. 3. Some of those who are addicted to drugs desperately want to get free and are trying. 4. Some of them have girlfriends, wives, children, friends or other family members dependent upon them for food and money. They often get plates of food to take back to their loved ones. Sometimes, their children come with them. 5. Several of them are fellow believers who attend church elsewhere. They sometimes come requesting prayer. A few of them have even ministered to us with spiritual insights and encouraging words. One gentleman dazzled us on New Year’s Eve by singing a couple of old spirituals. 6. Many of them have cell phones. Not iPhones or Androids, but the cheap prepaid cell phones sold at the big box stores. This is so family members, aid workers, and employers can contact them. It’s a necessity, not a luxury. 7. Some of them are too sick, elderly or disabled to work. They come with walkers, wheelchairs, and canes. One gentleman has hands so weak he can barely keep from spilling his plate. Sounds a lot different than what you hear on the news, huh? – Only 26% are mentally ill.
– As many as 40% are veterans. About 80% of homeless veterans have mental health issues resulting from their military service. 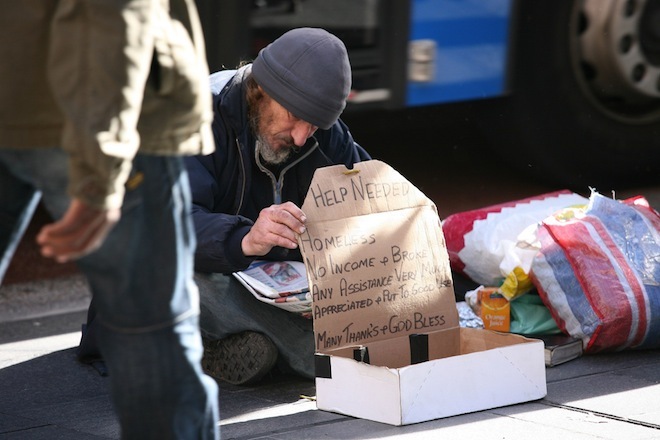 – Between 13 and 25% of homeless people have jobs. – “Until its repeal in August 1996, the largest cash assistance program for poor families with children was the Aid to Families with Dependent Children (AFDC) program. The Personal Responsibility and Work Opportunity Reconciliation Act of 1996 (the federal welfare reform law) repealed the AFDC program and replaced it with a block grant program called Temporary Assistance to Needy Families (TANF). In 2005, TANF helped a third of the children that AFDC helped reach above the 50% poverty line” (emphasis mine). But be careful if you help such people, others warn, because there might be an undeserving one in the crowd seeking to take advantage of your goodwill. Gasp! Say it isn’t so! I’m sure Jesus will roll right off of his throne if I happen to give a free meal to someone who could have bought their own McDonald’s cheeseburger. I can’t tell you how many times I’ve heard statements like this from decades-long believers. Ask yourself honestly: Do any of these statements convey a Christ-like attitude (let alone any knowledge of reality)? I recently came across a blog post by a friend of a friend about giving to the poor. The title of the post is “Helping the ‘Poor’ – 101.” Right away, we see ‘poor’ in quote marks, which suggests that this is a term with no real meaning–that genuinely poor people don’t exist. Yup. In Deuteronomy 15:11, Proverbs 31:9, Luke 12:33, and Luke 14:13. And when Jesus speaks of giving all of one’s possessions to the poor, he doesn’t attach provisos or make distinctions between “worthy” and “unworthy” recipients. The Bible also outlines the judgment that will befall those who refuse to help the poor in Proverbs 21:13, Matthew 25:41-46, Proverbs 28:27, and Deuteronomy 27:19. In fact, there are over 100 verses that speak about the poor, whether commanding believers to care for them, warning not to oppress them, or driving home the fact that God cares for them. Funny how not a single one of these verses appear in this guy’s post about helping the poor. Do you realize that… “Poverty & being Poor”… can be the Judgment of our Holy God; The God of the Bible…? Did you know that… in giving to some of the Poor… you are staying God’s hand of Judgment on them…? Granted, I don’t have the entire Bible memorized. But I’m pretty familiar with it, and I can say with some assurance that NOWHERE does this idea exist in scripture. First of all, any instances that can be construed as God visiting poverty upon sinners (which are extremely few–like, maybe, three), are confined to the Old Testament. There is no mention of such judgment in the New Testament. Second, NOT ONE SINGLE VERSE EVEN HINTS that helping a poor person, even an undeserving one, stands in the way of God’s will. Not. one. “Before you get involved helping “Others” – Do You ‘Pray’ about It”…? Nope. I don’t feel the need to pray about something that the Bible has clearly commanded me to do, and will clearly bless me for doing it and clearly curse me for not doing it. Now, I can pray for wisdom and discernment if I think someone may be trying to take advantage of me, but I don’t have to ask God whether he wants me to help others. It would be like asking God if it is ok for me to commit adultery. I already know the answer. Perhaps IF we would examine our motivation… we might just realize; that we are doing our… ‘Good Deeds to the Poor’… to be seen by Others…? 1. You somehow manage to bring up your volunteer work in nearly every conversation you have, including those with strangers at the supermarket. “Oh, don’t mind me. I’m just buying these tomatoes for the homeless.” It also appears in every other status and comment on your Facebook page. 2. You seek compliments and gratitude for your contribution. When they aren’t forthcoming, you become angry and depressed. When they are, you gush like a schoolgirl and ramble about yourself for the next 10 minutes. 3. You call a local paper or TV station to do a story on your outreach ministry, hoping you’ll be named or quoted. 4. You mention offhand to your pastor or another church member that the church should have a ceremony to honor outreach volunteers. If having not received recognition for your contribution after several weeks or months, you consider quitting. 5. You talk about how much you contribute, either in time, effort or money. If you’re doing any of these things, you’re in it for the wrong reasons. Otherwise, you’re gravy. Occasionally, I have preached at open air ministries where a Church… fed the Poor. Some would stand across the street… as to not hear the Gospel message… and then come over to be fed. We started passing out tickets… so that one had to hear the message… before getting fed. Some of the Poor… did not like that; and ‘openly’ complained. We simply told them… we are not here to ‘just’ fill your hunger; but to try and help you in ‘all’ areas. If you ‘do not’ hear the message… you are ‘not’ privileged to eat. […] What good is a ministry to the Poor… only taking care of their Physical needs… and “Not their Spiritual Ones”…? […] “He that would Help–Others… ‘Must’… Require ‘Something’… of Them”…! 1. “The physical and spiritual are not related. I’m not ministering to anyone spiritually by simply giving them food” (unbiblical). 2. “Obviously, you are poor because you have spiritual problems. Hear my sermon and learn how you can do better” (unbiblical). 3. “I have all the answers you need, even though I know nothing about your particular situation and don’t care enough to ask” (arrogant). 4. “I will minister to you in the way I think is appropriate, whether you like it or not, rather than allowing you to communicate your needs first” (arrogant). In my church’s ministry, we feed people first, then offer to pray with them. Once their physical needs are met, they’re more open to having their spiritual needs ministered to. (It’s the basic principle summed up in Maslow’s Hierarchy of Needs.) Also, letting people minister to you spiritually requires a form of trust. I would find it very difficult to trust someone who would let me starve just because I refused to pray with him or her. Finally, the Bible does not say anywhere that we are to require anything (including spiritual participation) from anyone we help. In fact, God says he will reward us for helping those who can’t repay us (Luke 14:13-14). I’m pretty sure such forms of repayment include adopting our spiritual belief system. Yes, I would much rather give to someone who is truly in need than someone who thinks they need to keep up with the Joneses. I’m not about to pay for someone’s cable bill. And I’m looking forward to the day when my church can offer job counseling, drug rehab, and education to help the homeless in our area get off the streets for good. After all, the point of giving is to break the cycle of poverty, and doing that requires a comprehensive approach and consistent effort. However, I would caution my fellow Christians against refusing to give out of fear. I’d much rather give to an “unworthy” person than risk withholding from someone who truly needs it–because that, my friends, really is a sin. This entry was posted in Social Issues and tagged generosity, giving, heresies, ministry. Bookmark the permalink. I like your grit. Your concern and message is right on and timely for these lukewarm days. I will keep reading, no matter how many times I get my toes stepped on. Great article Bro. Dean….you guys keep up the good work. We are the proof that Jesus is real! Excellent posting, April! And as Butch says, it is sorely needed in these times. In the 18th century missionaries in China would do much the same thing. You can only have some rice if you promise to become a Christian. They were called ‘Rice Christians’. Seems not much has changed in some areas in this regard. Thank you for challenging us Christians to think about our motives and remember that God challenges us daily to care for the poor and that Jesus did it regularly in his ministry.